Dorados new head coach Diego Maradona has reflected on his past life and reveal how things were difficult for him and all the things he had to past through. 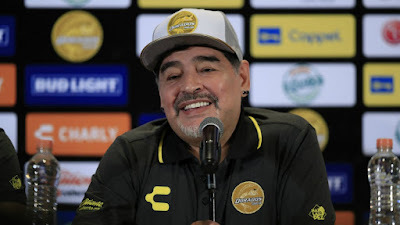 Maradona was appointed has Dorados head coach last week when the club parted with thier former coach Francisco Gomez. The Argentina legend is overwhelm by the job and wants to give all for the club. Maradona had his first interview with the press since joining the club last week and he took time to explain what happened to him in the past and how his daughters helped him to be strong. Maradona will hope to do well in his new club and it will really be a big challenge for him as the club is currently sitting at the bottom of the table.